Many people shy away from creating new gardens because they fear that, after all the hard work necessary to build them, their gardens will not look as nice as they envision. Taking the time to properly design a garden will certainly pay big benefits once the job is finished. If you know you want professional help, we recommend you interview and select a professional landscape architect or garden designer. Remember, selecting a garden designer is a very personal decision much like selecting an interior designer so interview possible candidates and ask to see examples of their work to make sure you both share the same aesthetic. You can also drive around your neighborhood to spot yards/gardens you like. Then, ask the homeowner who landscaped their yard. Most homeowners would be happy to provide you with this information. Here are two good resources for locating St. Louis area landscape and garden designers: St. Louis Chapter of the American Society of Landscape Architects and the Missouri Landscape & Nursery Association. The later has a search page where you can select what services you require. State law requires that a utility locate request be placed before beginning any excavation. The first thing a responsible homeowner should do is to call their state’s utility locating service and have underground utility lines located and marked. The service is free of charge and helps to protect people from personal injury and from damaging gas and electric lines that may be present. In Missouri, call the Missouri One Call System 1-800-DIG-RITE (800-344-7483) or 811 or place your request online. In Illinois, call JULIE (Joint Utility Locating Information for Excavators) by simply dialing 811 or place your request online. Once you know where the underground utilities are located on your property, you can begin designing your garden. Where will your garden be located? 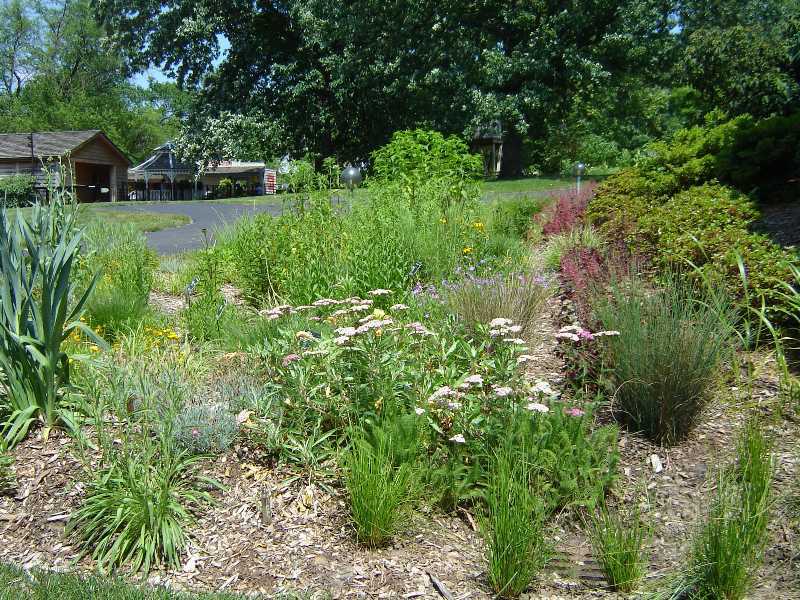 Will it be a welcome garden situated in your front yard, a shade garden under that backyard tree where grass will no longer grow, or a garden that attracts birds to your property? The first step is to envision your new garden and define its boundaries. If your garden is to have straight sides, some stakes and string line can be used to block off the space. If you envision a rounded, curved edge to the planting bed, use a length of hose laid out on the ground to set the boundary. Once you have done this, mark the boundaries using a spray can of marking paint. Every good garden starts with a good plan. Take the time to draw an aerial view of your garden as close to scale as you can. This is not difficult to do using a tape measure, some graph paper and a pencil. Start by drawing the boundary, using the squares of the graph paper to represent a predetermined distance. After the boundaries are drawn, sketch in any existing features that will remain part of your garden after it is completed (existing trees, shrubs, walkways, walls, fences, etc.). At this point, if your drawing is small enough to photocopy it, you may want to make a few copies in case you would like to create multiple designs. Next, let those creative juices start percolating and sketch in the plants that you want in your garden. This part is both creative and practical. You must keep in mind the site conditions that exist in your garden (sun/shade, wet/dry, slopes, deer, etc.) in addition to the artistic choices. Every type of plant grows best within its optimum growing conditions, and paying attention to individual requirements will reward you with healthier, happier plants once your garden is finished. To help deal with difficult site conditions, use our Plant Finder, where you can create lists of plants that meet specific requirements including those that are tolerant of some difficult conditions such as wet soil, dense shade or deer resistant, for example. Variety adds interest and excitement to a garden. Your mantra as you select plants should be “How will this plant contrast with the other plants I’ve chosen?” By varying leaf shape, leaf color, flower color, mature size, seasonal interest and bloom time, you can create a garden with constant appeal. For example, planting hostas next to ferns allows for contrasting leaf textures; ornamental grasses and shrub roses also work well together in a full sun garden; and interspersing plants with variegated or colored (other than green) foliage is a nice way to add variety, too. A word about plant size: always keep in mind how large your plants are expected to grow. It is tempting to install more plants than necessary when they look so small at planting time. Perennials and annuals are generally easy to thin out when they’ve spread too much after a couple of years, but trees, shrubs and evergreens are much more difficult to control when they begin crowding each other. Resist the urge to design a garden that looks full immediately. It may take years for some gardens to become the beautiful work of art that the designer envisions. To research the height, spread and other information about the plants you want, use PlantFinder. Once your plan is finished, you can build and plant your new garden. The design will never be completely finished, however. Every garden, no matter how young or old, is a constant “work in progress”. Plants may suffer or perish due to insect or disease problems, severe weather events, or overcrowding as they grow and increase in size. When these things happen, periodic removals and/or replacements may be necessary. This is part of the fun of garden design – the opportunity to change and refresh your pallet, adding new plants or using old favorites in new combinations. Garden design is one of the most rewarding horticultural activities available. Whether you are starting small with a little planting bed next to the patio, or moving into new construction with nothing but bare ground, taking it one step at a time will take some of the apprehension out of the design process. Visit the Missouri Botanical Garden and the Kemper Center for Home Gardening whenever you are looking for fresh design ideas. There are no better places to look for new, exciting ways to design and create beautiful gardens!